Troy Rogers controls his robot ensemble from his laptop. On the altar of a former cathedral in Duluth, Minn., an ensemble of musicians begins to play. Their notes are piercing and sometimes dissonant. 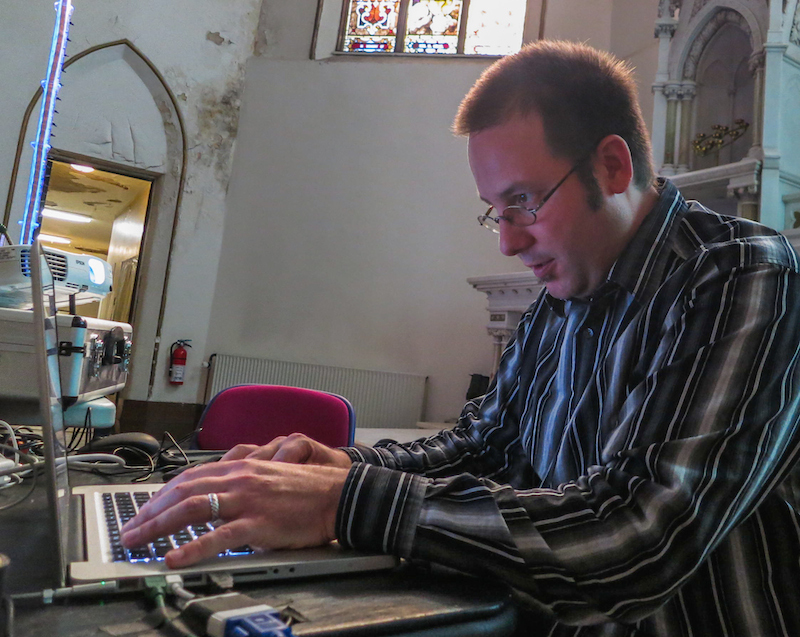 It’s not your typical cathedral music—but then again, these aren’t your typical musicians. None of them look like robots, though. They look more like futuristic instruments. Troy Rogers is their creator, and he introduces them one by one. First there’s AMI, short for “automatic monochord instrument.” It’s a sheet of clear plastic stood on end with a guitar string stretched across it. Some electromagnetic levers press down on the string to change the pitch. It’s kind of a one-string electric guitar that plays itself. 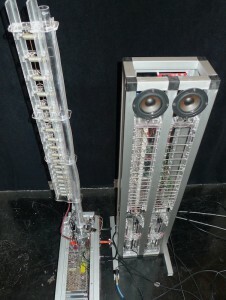 AMI represents one kind of musical robot, where the robot and the instrument are the same thing. The other kind is a mechanical device that plays a traditional instrument, like Rogers’ snare drum. About a dozen robotic arms reach across the top of the drum, poised to tap or pound the drumhead. Rogers built most of these robots with two other composers. Troy, Steven Kemper and Scott Barton started making robots together while they were in grad school, back in 2007. Their collective is called Expressive Machines Musical Instruments, or EMMI. “Now we live in different places and have joint custody of the robots,” Rogers says. He introduces a clarinet-like robot next. This one’s a clear plastic tube that stands about 3 feet high. It has valves along its length, and Rogers’ computer operates those to change the pitch. Rogers demonstrates the robots’ capabilities by having them play a piece based on Bulgarian folk music. The composition lives on Troy’s laptop as computer code. A wire runs to each robot, and the robot performs what the composer has written. 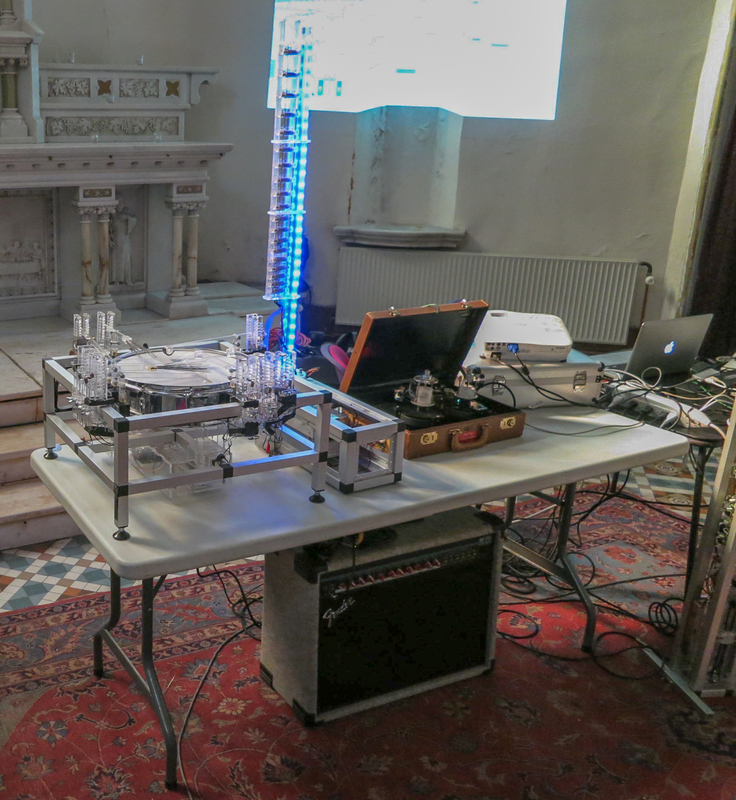 The sound is created by real, physical instruments. Those real instruments are initially what got Rogers started in music. He says he grew up playing guitar in bands. The term “composer” was new to Rogers, since he didn’t grow up with classical music. He liked Zappa’s take on it. Troy Rogers queues up his ensemble to play a piece based on Bulgarian folk music. 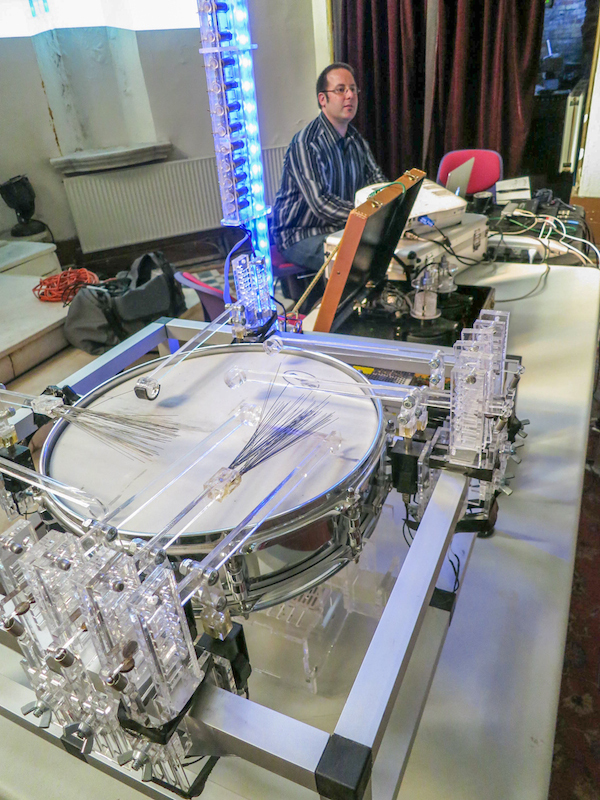 MADI, a snare-drum robot, is in the foreground. Once you accept that broad definition of music, Rogers says it’s natural to embrace music made by machines. He says mechanical instruments got their start long before computers. Rogers is finishing his Ph.D. in Music Composition and Computer Technology at the University of Virginia. He didn’t start out interested in building robots. He says he wasn’t one of those kids who likes to build stuff. He lived through that phase, thankfully, and eventually found himself in graduate school. 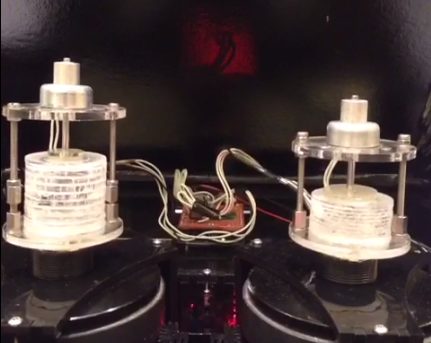 A couple of years in, he wrote some music for a digital player piano. But he was frustrated by the instrument’s limitations. So he started taking electronic devices apart and figuring out how they worked. Rogers’ first baby step toward building robots was to make an LED blink. Troy Rogers’ robot ensemble performs on the altar at the Sacred Heart Music Center in Duluth. Rogers kept learning from the Internet. Then he found other people who wanted to build musical robots, and they learned together. That’s when they formed EMMI. Troy says he’s a musician who just happens to have taught himself a lot of computer programming and engineering, but he’s not an engineer. In fact, sometimes Rogers and his friends do the opposite. “Sometimes the inefficient solution is the most musically interesting,” he says. Rogers still writes occasional pieces for voice or solo piano, but he says he’s drawn to robots because they can do things that humans simply can’t. Robots can play faster than humans, too. “Some of those trills or tremolos are happening at 40 times or 50 times a second,” Rogers says as one of his robots demonstrates. That precision is great, but Rogers says it’s only part of why he likes to work with robots. Rogers says experimenting with robots is no different from experimenting with acoustic instruments. Still, Rogers says robots have their own set of limitations. Or maybe it makes more sense to say that trained human musicians bring things to music that robots don’t. Expression, for instance, and vibrato. Sometimes Rogers emulates a more human sound with a robot. Enter the fourth member of Rogers’ quartet. Once the full robot quartet is plugged in and ready to go, Rogers queues up a piece based on Ugandan folk music. His instruments begin to play—just as they do every time he asks them to. The robots might require a lot time and energy, but on the plus side, Troy Rogers has a house orchestra that’s always ready to play. And they hardly eat anything.